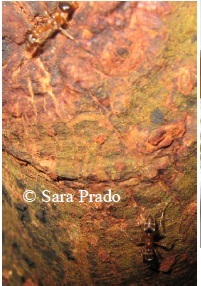 Pseudomyrmex (triplarinus) – Tangarana – -Sara Guiti Prado- Ph.D. Most ants of the genus Pseudomyrmex are arboreal and are part of a pantropical group of arboreal, twig-dwelling ants confined to tropical forests, woodlands, and savannas. Among the estimated 300 species of Pseudomyrmecine ants (subfamily which includes the Pseudormyrmex genus), 20% have an obligate symbiotic relationship with Myrmecophite plants. Evolutionarily speaking, the relationship between the ants and domatia bearing plants is believed to have evolved at least 12 times within the subfamily. 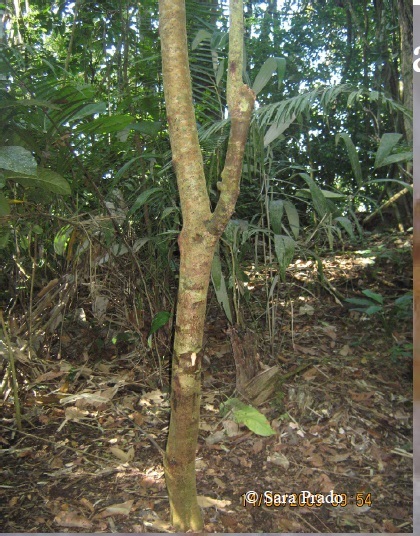 Some examples of the genera of these ant-plants found in the neotropics are Cordia, Mycia, Tachigali and Triplaris. 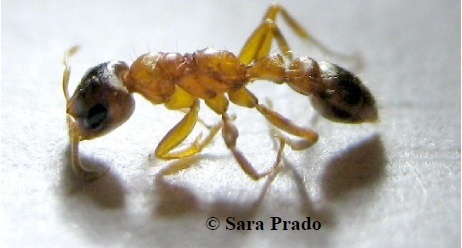 Five species of Pseudomyrmex are obligate associates of trees in the genus Triplaris (Ward 2002). In most instances, the plant provides a hollow or excavated cavity (domatium), in which the ants keep brood and scale insects. Scale insects are small insects from the order Hemiptera classified in the subfamily Coccoidea. In exchange, the ants protect the plant from herbivores and sometimes, from other competing plants that may grow on or around the tree (Ward and Downie 2005). This type of relationship is not unique. As a matter of fact, there are hundreds of plants in more than 40 families that possess specialized structures to house ants and many of these plants also supply nectar and food bodies to the ants. In exchange for this shelter and nourishment, the ants are responsible for clearing the vegetation surrounding the plant, and protecting it from herbivores. As there is a symbiotic relationship between ant and plant, both benefit from the well-being of the other. Thus, as the plant’s growth is strengthened, the ants benefit from the increased health and vigor of the host plant (Davidson et al. 1988). It’s believed that the relationship between the Pseudomyrmex ants and the Triplaris plant has existed for at least several million years, and possibly much more (Ward 2002). Workers readily attack intruders and they clear vegetation from the base of the host tree. Triplaris Americana is one of the species of Triplaris that is known to have a relationship with these ants. Pseudomyrmecine ants are omnivores, feeding on things such as honey, crickets and pollen. They are able to communicate the presence of food and are always seen foraging in large numbers. They are also highly territorial and their markings, which are colony specific, can last 30-60 minutes. The Triplaris trees to which these ants can be found to be associated, have a hollow heart. The ants enter the trunk by perforating a 2mm-in-diameter entrance in many places along the trunk and twigs, to make their way to the central opening (Jaffe et al. 1986). The wastes of the colony do not remain within the trees corridors; rather they are thrown out, down the tree. The Triplaris tree has quite an interesting history with the natives in the area. It’s known as the ‘justice tree’ in certain tribes, such as the Machiguenga and the Ese Eja. The reason they give this plant such a name, is that this tree was used to punish people from the communities, who didn’t respect the rules. The rule-breakers were tied to the tree using, for hours, using a very strong liana, which could not be broken, until they begged for forgiveness for their mistakes. It’s also said that, many years ago, when the first pioneers came to the Madre de Dios area, from different cities around Peru (Pucallpa, Iquitos, Tarapoto), the hunters, hoping to encounter large prey such as tapirs, wild boars and monkeys, instead encountered many cadavers tied to these trees. Around the cadavers of the indigenous people, the hunters found arrows and tribal gowns. One of the interpreters at the lodge performed a small study on these tangarana ants to see how far from the tree the ants would clear the vegetation. Moises, the guide, planted beans and let them sprout, measuring the distance from the tree and the saplings. His studies lead him to conclude that these ants clear the vegetation around the tree, up to a distance of 120cm. This very interesting relationship occurs when the ants collect the materials they use to build their nests. While gathering the soil and plant matter, they also gather seeds of symbiotic plants, also placing them in the nest. These seeds then grow into plants, which are nourished by the materials in the nest, and the roots become part of the nests’ framework. The ants then feed on the food bodies, fruit, pulp and nectar provided by the plants. Davidson D. et al. (1988). Pruning of host plant neighbors by ants: an experimental approach. Ecology. 69 (3): 801-808. Ward, P. S. (1999). Systematics, biogeography and host plant associations of the Pseudomyrmex viduus group (Hymenoptera: Formicidae), Triplaris– and Tachigali-inhabiting ants. Zoological Journal of the Linnean Society. 126:451-540. Ward, P.S. and D.A. Downie. (2005). The ant subfamily Pseudomyrmicinae (Hymenoptera: Formicidae) phylogeny and evolution of big-eyed arboreal ants. Systematic Entomology. 30: 310-335. May 2009. 13 July 2009 <http://www.sciencedaily.com/releases/2009/04/090428111535.htm&gt;. Larrea-Alcazar, D.M. et al. (2007). Why are there few seedlings beneath the myrmecophyte Triplaris Americana?. Acta Oecologica. 32: 112-118. Hink, W. F. et al. (1989). Inhibition of human platelet aggregation and secretion by ant venom and a compound isolated from venom. Medicina, 13 (2):175-184. Jaffe, K. et al. (1986). On the communication systems of the ants Pseudomyrmex termitarius and P. triplarinus. Insectes Sociaux. 33 (2): 105-117. New publication on sampling bees in tropical forests and agroecosystems!